A group of 14 set off from Mossley Mill car park on an unseasonably mild December morning for the 3 mile walk to the Loughshore at Whiteabbey, and back again. The first section of the walk was through the pretty Three Mile Water Conservation Park, mostly alongside the river of the same name. This small river once powered 7 mills in Victorian days on its short journey to the sea. built in the late 1840s is still in use for the Larne- Belfast line. walk in approx 2 hours, averaging a ​commendable 3 mph. We all then enjoyed a pleasant lunch at the Mossley Mill restaurant in the Civic Centre. We had a very enjoyable walk around Scrabo led by Gordon. Walked round Killynether wood and the Quarries. A very healthy 16 turned up and we retired to Scrabop Golf Club for lunch where a very pleasant table laid out with a glorious view of Strangford Lough. Not quite silver service - no linen napkins, but very convivial so much so that I had to excuse myself to get home to walk the dog before it got dark. considerably and when we arrived there were 10 others anxious to get going. We had a particularly nice walk round half the perimeter of the demesne. The trees were very attractive ​with their autumn colours. Proceedings concluded with a very convivial lunch in the National Trust cafe. down at base camp. Seven or us repaired to the cellar restaurant at nearby Belfast Castle for a light lunch and plenty of chat. As ever, good company, a bit of exercise and we all felt the better for having made the effort. Thanks to David for organising. The Red Sox launched their new season of Wednesday morning walks with a visit to the recently opened Gobbins Cliff Path Walk on September 9. The size of the party was limited to 15 which was a pity because we could have taken several more. However, no doubt The Gobbins will feature again, perhaps as part of a Saturday walk. We met at the impressive visitors' centre near the Rinkha on Islandmagee. Plenty of car parking space, and a lovely restaurant where the coffee helped us revive after all the travails of driving through all the roadworks at Jordanstown. We checked in and because we were a party of 15, we qualified for a 10% discount. We decided to give the resulting £10.50 to the Mourne Heritage Trust. The centre boasts an informative and well organised display about The Gobbins so we had a browse there before reporting to the briefing room, where we were togged out with the obligatory helmets and given a safey brief. We were also shown a short film explaining how the walk would pan out. The health warning was quite severe - but probably justified. Once the minibus deposited us at the top of the laneway leading down to the Gobbins we encountered a steep descent to the coastline. We paused a couple of times as our guide George got into his stride and he proved to be a veritable mine of information. Very well briefed but his voice was having to compete with the breeze and the roar of a fairly lumpy sea with a good swell which sent waves crashing into the rocks beneath us. The start point is the famous Wise's Eye where we ducked as we passed through an entrance gate (locked behind us) and onto the Gobbins Walk proper. A railing to protect us on the seaward side and above us very dramatic cliffs. En route there are, as the film has advised, a number of short but steep flights of steps to carry us round the coastline. And the helmets were advisable - every now and again we encountered rocky outcrops which could have resulted in a bump to the head. bridge. The different designs, George told us, were designed to show off Belfast's engineering excellence to the wider world. And at one inlet, known as The Gallery, we were told that day-trippers gathered in Edwardian times to watch the newly built vessels from H&W (including, inevitably The Titanic) undergoing tests. Perhaps the most awkward section of the walk was down steps into a dimly lit tunnel, along a platform and into a cavern from where we ascended a steep rung of steps to emerge into the daylight. At journey's end we saw the location of the puffin nests which are such a feature in June. Evidently the birds were not fazed by the building of the walkway, but restrictions will be in place next year when the puffins are hatching their eggs. The walk is a dead end so we had to retrace our steps, total distance around 3 miles, but time from the centre and back again - three hours. So much to take in, and as Tony Blair would have said, we could feel the hand of history on our shoulders, The original Gobbins opened in 1901 and was the brainchild of Berkeley Deane Wise, the celebrated engineer of the Belfast & Northern Counties Railway. It was he who developed Whitehead as a destination, shipping sand from Portrush to create a beach (sadly all washed away the following winter) and offering people who bought villas free season tickets for five years of travel to Belfast. The Gobbins was designed primarily to persuade people to come from Belfast and then travel by pony and trap or charabanc to the path for a breath of fresh air, no doubt a pleasant change from the smog of Belfast. Among Wise's other achievements were the design of the distinctive Portrush and Whitehead railway stations, not to mention Glenariff tearooms and the development of Glenariff itself. The Gobbins represents an investment of £7m, thanks to EU assistance, but by common consent, we felt it was money well spent. Such is the popularity of The Gobbins that the tours are shortly to move from hourly to half-hourly intervals. Some of the rules - no walking sticks, no back packs, no trainers, free lockers at the centre to deposit bags in. Not possible to bale out half way through, you need to take the entire trip, because you have to leave your helmets back at the centre upon return. A sunny and warm evening greeted the 13 Spartans enlisted on Gerard O'Sullivan's walk at Cavehill on Wednesday August 12. Luckily for them the visibility up top was magnificient. We could see as far as Slieve Gullion and Flagstaff Mountain to the south, while the Mournes were most dramatic - bathed in evening sunshine. completed a clockwise circuit of the mountain and were back at the cars by 9pm, all safely accounted for, even the two who ventured up to have a peek into the cave on the way back down. Thanks to Gerard for organising a memorable evening. Timing is everything and so it was with the Wednesday walk on August 5. On an overcast but warm evening it stayed dry until 9pm, at which stage the heavens opened. But by that time we were all safely back in our cars or on our bikes. Leader Steven McBride had wisely kicked off from the Lockview Road car park at Stranmillis at 6.45pm and six Spartans participated. strange piebald colour, any ideas anyone? Across the bridges over the canal bed and the river and upwards to Belvoir Forest Park car park, where we watched a rather fearsome group of lady boxers going through their exercises in some sort of boot camp. We prudently kept our distance. Tradition was turned on its head when Steven elected to do an anti-clockwise lap of the path around the perimeter of the forest. We saw views we had never seen before, a refreshing change. Time for a quick trek up to the Norman motte, which according to the NI Direct website, dates from the 12th century. soon to be felled Lawson cypress trees which, again according to the NI Direct website, are suffering from Phytophthora Lateralis, whatever that might be. Back across the river and along the towpath, with darkness gathering and the clouds thickening, we felt the first tell-tale spits of drizzly rain. Accordingly, we hastened our pace and were soon home and dry. Many thanks to Stephen for organising and leading. As ever, much better to get out there and go walking than to sit at home wondering if it is going to rain. On a dull, cool but dry evening 22 Spartans set off up Cregagh Glen on the evening walk. On route we stopped at Lisnabreeny American Military Cemetery which is not very well known, in fact many people did not even know it was there. Continuing along the path we met another member of the Spartans who was taking her dogs for a walk. There were good clear views over Greater Belfast, the Lough and as far as the Mournes from the highest point of the path. With the return journey being all downhill we arrived back at the cars having enjoyed the walk. A small but high spirited group set off from Moira train station at 10.40am, to walk the 7 miles to Aghalee and back. Conditions were dry but cloudy, and Celia at the BBC Weather Centre had warned of rain in the afternoon, so confidence was high that we would be finished before it arrived. After the first mile we passed Soldierstown car park/picnic area, and after a quick coffee proceeded on to the aptly named Broadwater. There was a lot of bird life as always and on this occasion we were entertained by large numbers of diving swallows,and later by house martins. Broadwater looks like a natural lake, but is in fact man-made,having been developed in the 1830s in a valley as part of the connecting waterway between Lisburn and Lough Neagh. Soldierstown picnic area was out of the question.Not far from the end point we were charmed by 2 swans,the mammy and the daddy,swimming along with 7 cygnets between them. It was a beautiful moment and ready- made for a photo,but we were too wet to get the cameras out ! We finished back at the Moira train station car park,wet but invigorated-and for one enthusiast in our group it was a great warm up for the Murlough walk that evening. It was a beautiful sunny evening as we met Jack (about 8 - 10 of us) ... and headed off from the Crawfordsburn Inn on a two hour (... and a bit) walk that took us down through the glen and into a little of Clandeboye Estate and onto the North Down Coastal Path and back via the Country Park. The evening light was wonderful and we had views to the Lough with sailing boats and ships and in the distance the Scottish coast. There were great signs of Spring with flowers everywhere - the smell of the bluebells along the paths was great. We visited the new bridge on the coastal path and everyone seemed very impressed. Our walk finished with a beverage in the Crawfordsburn Inn. The walk was a great way to utilise these lovely long Spring/Summer evenings. 13 Spartans gathered at Belvoir Park car park for the walk on a grey but dry morning. We set of through Belvoir Forest stopping at the Motte where Pat gave us a brief talk on it's history. Continuing on along the forest path we admired the carpet of bluebells which was just starting to bloom. When we emerged from the forest at the Lock Keepers cottage we walked along the Lagan towpath as far as Gilchrist's bridge & then back along the other side until we reached the Lock Keepers cottage again where 8 of us had a pleasant if chilly lunch outside as there was no room inside. We then continued along the tow path crossing the bridge back into Belvoir Forest and back along the river to the car park. Fortunately the rain which was forecast did not arrive until we reached our cars. We also welcomed 2 new members - John & Alan on their first walk with the Spartans. Scrabo Country Park was our destination for the Wednesday walk and with Gordon Davis at the helm we got more than just a lovely walk. With his sharp eye and keen ear, Gordon was able to identify flora, fauna and wildlife with ease. We enjoyed a marvellous view of a blackcap in full song, heard the unmistakable call of the chiff-chaff and then the melodic cadence of willow warbler and identified the carpet of wood anenome. We looked suitably smug, therefore, as we passed a group of ornithologists who were armed with everything from binoculars to cameras with telephoto lenses. the distant Mournes before setting on the Killynether leg of the walk. This took us through woodland and down to a tranquil duck pond where the water was shimmering in the sunshine as we took a break on the boardwalk. Then it was uphill and we paused to enjoy another fine view across drumlin-dotted farmland. light aircraft taking off from the airport looked just like a toy. Having bagged the wildlife we then returned well exercised to the car park, where five of us took the short walk uphill to Scrabo Golf Club for a light lunch. The clubhouse is perched on the hill close to the familiar landmark of Scrabo Tower (temporarily closed). The clubhouse, by contrast, is very much open to visitors and from the dining room there is a breathtaking view down across Strangford Lough. A fine repast was enjoyed at very reasonable prices - and a warm welcome from the staff. Many thanks to Gordon for taking the walk at short notice and for inspiring us about the natural wonders of Scrabo. parked cars. With the sunshine, blue sky and lack of wind it was a great day to be out. We then retired to The Village Grill in Dromara for lunch - a fitting end to our walk! A new record was set on February 4 when some 18 walkers materialised for Peter White's excursion to Tollymore Forest Park. Although some came and went during the morning, and we eventually made a rendezvous with a group of four which had made a slightly late start, it was the largest turn-out so far for an SRS Wednesday morning walk. We were particularly cheered to welcome back to our ranks Norma Byers, this time accompanied by husband Neil. Just two weeks after her tumble, Norma's right arm was still in plaster, but she coped superbly with the walk. coated in snow, which under a blue sky made the forest track look very attractive. We enjoyed lovely views as we first walked along the bank of the Shimna River, and then it was uphill to join the Drinns Trail. As we gained height we paused to savour the sensational landscape, across to the dramatic snow-capped peaks of the Mournes, down across Newcastle to the blue waters of Dundrum Bay and then across to Slieve Croob, looking its best in a covering of snow. The chat was good and the company convivial and we kept up a good pace as Peter (celebrating his 72nd birthday which had fallen the day before) led from the front. Back down past the lake and over the Old Bridge across the Shimna and so back uphill to the car park. After a stiff two and a half hour walk thoughts and tums turned to lunch and we repaired to the Burrendale Hotel where we enjoyed a light lunch with silver service. The world was put to rights and we also caught up on news of the previous Saturday's walk across the snow fields to Chimney Rock - dramatic pictures by Rachel Flinn - and also on the SRS dinner which had taken place the previous Saturday. An excellent day out, thanks to Peter for organising. Last minute change of plan saw the Wednesday walk for January 21 being diverted from the originally planned location of Victoria Park (too short a walk) to Colin Glen Forest Park, which offered a more challenging four-mile walk from the Stewartstown Road entrance. Fortified by a cuppa in the excellent cafe at Colin Glen centre, 10 SRS members set off up the pretty riverside walk. It was cloudy and chilly but dry and the skies gradually cleared. We followed the red markers on the circular Hannahstown trail, which took us across a bridge where an energetic collie dog was pitching fearlessly into the chilly waters of the gurgling Colin River time and again to retrieve a stick for its owner. impressed by the display of the 190 million year old fossils of dinosaur type creatures. In those days, of course, Ireland was under water and was located where Africa is now to be found. On through the woodland and up to the bridge under Upper Springfield Road, where there was evidence of a channel created for an industrial water wheel. Having been advised that access to the National Trust owned link to Hannahstown Road was closed on health and safety grounds, we turned left and followed a rough path along the right hand bank of the river in what it known as the Colin Glen Fault. The path stopped abruptly at the abutment of a one-time and no longer extant bridge across the river. Surely the National Trust should a replacement which would open up yet more of this attractive area. David Wiggins went off to collect his car and bring it to the nearby Upper Springfield Road. Thanks in particular to Rachel for taking control of the situation in such a professional way. David Flinn provided a coat to keep Norma warm while Stephen Pearson was on hand with painkillers. A great team effort, my thanks to all for the way in which they handled the situation. Suffice it to say that Norma was ferried to the Ulster Hospital A&E where she was in an out within 45 minutes, emerging with the break re-set and her arm in plaster. We wish her well as the fracture heals and we hope she makes a full recovery. The rest of us made our way gingerly back down the waymarked path which took us across the river and down the right hand bank on the way back to the Colin Glen centre. It was a walk of four miles, and one which is to be recommended. 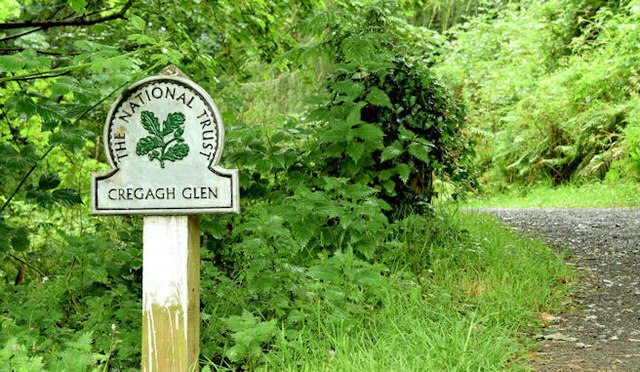 As the Walk NI website says, Colin Glen Forest Park is rightly regarded as Belfast's green lung. So easily accessible and yet a world away from the busy streets. Eight Spartans ignored the weather forcast to arrive at Whitehead for the walk. In fact we had sunshine at the beginning of the walk and walked in the dry. The rain only came in after we sat down for lunch at the end. We walked to Whitehead Harbour - this route I fear will soon not be available due to fences. We then walked to Black Head and back. Despite a decidedly ominous weather forecast, the new season of Spartan Red Sox Wednesday morning walks was successfully launched on January 7 with an ascent of Cavehill. It turned out to be a two-pronged offensive, with walk leader David Wiggins and Robin Morton heading off shortly before 11am - to be followed shortly afterwards by Angela Collins and Bronagh McGarry. Unfortunately the two groups failed to meet up until the end of the walk but it turned out that everyone had followed the same route, an anti-clockwise circuit of Cavehill. just the odd skiff of light rain. And the views over north Belfast, Belfast Lough and over to the Castlereagh hills and distant Strangford Lough were as captivating as ever. We watched for a while as a Stena ferry got caught in the side-wind as it attempted a rather tricky three-point turn in the Port of Belfast. David even managed to include a view down to Belfast zoo where we were able to see the bears in their enclosure. surfaced path. Nice glimpses of Squire's Hill, but lunch was beckoning and so we hastened on down to the car park. Time was still on our side so we repaired to the Cellar Bar in Belfast Castle where a bowl of warming soup proved to be very restorative. Thanks to David for sticking to his guns and pressing ahead with Plan A, despite all Barra's dire warnings. A bracing walk, some good exercise and a great way to banish the January blues, not to mention all those New Year cobwebs!